1. Put the chocolate pieces and coffee in a heat-proof bowl over a pan of hot water and heat gently until the chocolate melts, stirring occasionally. 2. Remove from the heat and leave to cool slightly whilst you separate the eggs. 3. 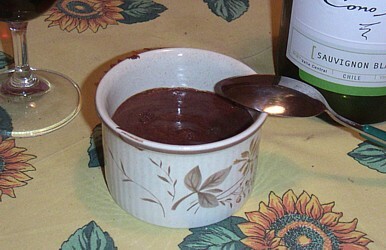 Beat the egg yolks and gradually stir into the chocolate mixture with a metal spoon. Stir in the rum and put to one side. 1. Whip some cream and pipe / put a spoonful on top of each mousse.